Our main goal is to make every child the best that they can be. In this policy, ‘transition’ describes the movement that takes place from one familiar setting to another. It is defined as the process where policy and practice has been adapted to support children settle in to their new learning environment in preparation for future learning and development. The curriculum makes it very clear that these points of transition must be planned for with care, considering the needs of each individual child and meeting their particular transition needs. Children and parents/carers need to feel secure and confident to face the changes as they progress through their school life. 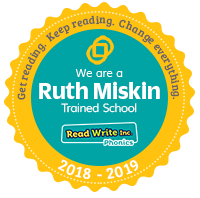 We want our children to experience a successful transition throughout their learning so that the pace and quality of learning are maintained to ensure every child continues to make the very best progress. We also recognise that children can be vulnerable at each stage of transition and subsequently implement a range of strategies and activities to ensure a smooth and happy transition. Formal liaison between class teachers is organised towards the end of the school session when reports have been written and assessments are up-to-date. The meetings are held at a mutually convenient time in the summer term when the teachers know the class they will have in August. At the meeting, details of individual pupils’ progress and needs are discussed and a written handover file is shared with the next teacher. This includes data, e.g. INCAS, Accelerated Reader reports and Single Word Spelling Test results, achievement of levels and next steps in learning. Other written information to be transferred may include comments from support staff and relevant medical information. Writing and maths jotters also move on with the children at the end of each session. Copies of all year stage overviews and medium term plans (including assessment comments and evaluations) are available electronically on the school server. It is not necessary to define the actual work covered by the children in a year-group class but teachers will know which areas of work may need particular attention the following year. Transition in the Early Years begins before the children start in Ante Pre-school nursery. All parents/carers, with a two year old child, on the NAMS waiting list, are invited into the school for our ‘First Steps to Success’ event. They are given a nursery rhyme book to take away and read with their child. This is then used regularly in Nursery during ‘Rhyme Time Monday’. During this event, the parents/carers also take part in three workshops – reading, numeracy/maths and developing independence/preparing for Nursery. From starting in their APS year, the nursery staff take detailed notes that inform the tracking for each individual child. This continues throughout their PS year and onto P1. Formative assessments also take place throughout the year and these are shared with parents/carers and passed onto staff at handover time. Transition from Nursery to P1 involves children from a range of private nursery settings, other ELC nurseries, schools outwith the catchment/cluster and Dunbar Nursery Class. We invite the children and their parent/carers, if they do not attend the school nursery, to as many transition events as possible. The Nursery PT and PT for Inclusion and Support organise enhanced transition experiences and opportunities for children with additional support needs or emotional and behavioural needs. This takes place throughout the year but more focused time takes place in the summer term. Seashore and Woodlands Nursery children visited assembly this morning. They sat beautifully and joined in singing Christmas songs! On Wednesday 20th September we are having curricular and social evening for all our Nursery Parents. A presentation will follow on Learning through Play and Numeracy in the main hall. There will also be a Stay and Play session in the Woodlands and Harbour rooms on Friday 22nd September from 8.30 till 9.30 . All parents with children in these rooms are welcome to attend. Haven and Seashore parents will have a Stay and Play session on Friday 6th of October from 8.30 till 9.30. These events are ion the school Calendar. As you’ll be aware the Scottish Government is planning to nearly double the hours of free early learning and childcare by 2020. Because the views of parents and carers are crucial for the success of this expansion, the Government has commissioned independent researchers to undertake a survey of parents. The survey link is here. 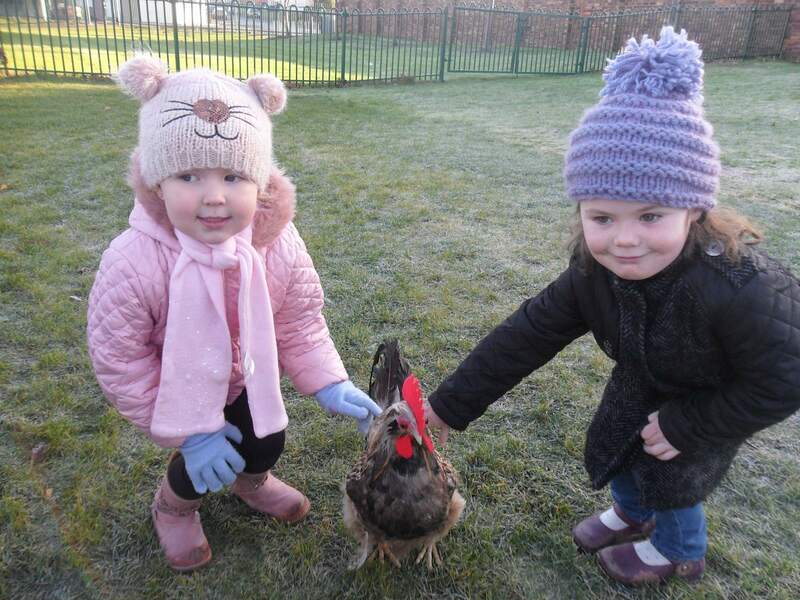 We encourage as many parents to contribute to this Survey Dunbar Primary School has one of the biggest Nursery Provisions in Scotland and it is vital that your views are gathered for the Dunbar Community the implementation in 2020. All parents taking part will have the opportunity to be entered into a prize draw and have the chance to win one of 10 x GBP100 cash prizes. 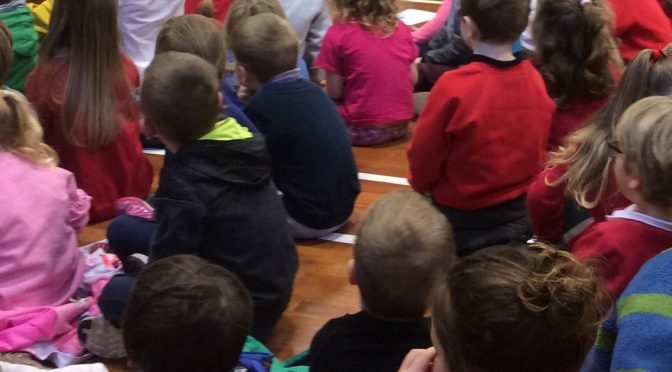 Nursery pupils joined P1 – P3 for the Harvest Assembly today. Take a look at Daisy the scarecrow below! It was made by Woodlands & Haven nursery rooms. 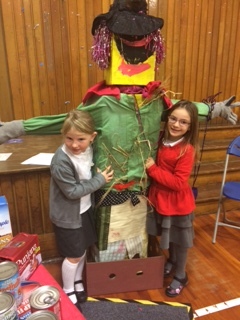 Two girls from the Eco Group are shown putting her in place for the assembly. Thank you for your kind food donations so far. 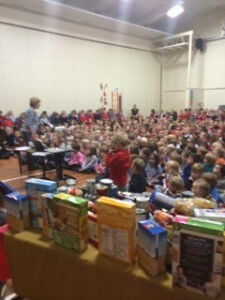 Another Harvest Assembly will take place on Friday 31st October at Lochend Campus. If you would like to donate an item of food to the Dunbar Basic Bank, please send it in with your child to either campus this week. Tinned vegetables, tinned potatoes, biscuits, breakfast cereals and tinned meats.